The role of the β2 adrenergic receptor (β2AR) in the regulation of chronic neurodegenerative inflammation within the CNS is poorly understood. The purpose of this study was to determine neuroprotective effects of long-acting β2AR agonists such as salmeterol in rodent models of Parkinson’s disease. Results showed salmeterol exerted potent neuroprotection against both LPS and 1-methyl-4-phenyl-1,2,3,6-tetrahydropyridine/1-methyl-4-phenylpyridinium–induced dopaminergic neurotoxicity both in primary neuron-glia cultures (at subnanomolar concentrations) and in mice (1–10 μg/kg/day doses). Further studies demonstrated that salmeterol-mediated neuroprotection is not a direct effect on neurons; instead, it is mediated through the inhibition of LPS-induced microglial activation. Salmeterol significantly inhibited LPS-induced production of microglial proinflammatory neurotoxic mediators, such as TNF-α, superoxide, and NO, as well as the inhibition of TAK1-mediated phosphorylation of MAPK and p65 NF-κB. The anti-inflammatory effects of salmeterol required β2AR expression in microglia but were not mediated through the conventional G protein-coupled receptor/cAMP pathway. Rather, salmeterol failed to induce microglial cAMP production, could not be reversed by either protein kinase A inhibitors or an exchange protein directly activated by cAMP agonist, and was dependent on β-arrestin2 expression. Taken together, our results demonstrate that administration of extremely low doses of salmeterol exhibit potent neuroprotective effects by inhibiting microglial cell activation through a β2AR/β-arrestin2–dependent but cAMP/protein kinase A-independent pathway. The β2 adrenergic receptor (β2AR) is a G protein-coupled receptor (GPCR) that is known to regulate a variety of biological functions, including the regulation of smooth muscle activity in the airway and vasculature. β2AR expression has been identified on immune cells such as macrophages, microglia, T cells, and B cells, and signaling through this receptor can influence the inflammatory response of these cells (1–7). The functional role of β2AR in biological responses has been further elucidated by the development of short-acting and long-acting β2AR agonists for pharmacological studies and clinical usage. Numerous studies using these β2AR agonists have shown that they possess the ability to regulate inflammatory responses by immune cells, and several of these agonists such as salmeterol (Advair) and formoterol (Symbicort) are already being used as anti-inflammatory therapeutics to treat asthma and chronic obstructive pulmonary disease (COPD) (8–10). However, potential use of β2AR agonists in neurodegenerative diseases in the CNS has not been well studied. It is now well accepted that inflammation plays a major role in the progression of a number of neurodegenerative disorders, including Parkinson’s disease (PD), Alzheimer’s disease, multiple sclerosis, and AIDS-related dementia (11). PD is characterized by the progressive loss of dopaminergic (DA) neurons within the substantia nigra (SN), which results in movement disorders as well as psychological/psychiatric changes in diseased individuals. Although the disease mechanisms that ultimately cause PD are still unclear, it is believed that the progressive nature of PD is characterized by chronic inflammation-induced DA neurodegeneration within the SN (12–14). The premise of microglial involvement and the elevation of proinflammatory mediators in PD have been supported by the analysis of post mortem brains from PD patients that provide clear evidence of microglial activation in the SN (15–17). Using various PD animal models, we and others have shown that microglia, the major immune cell of the CNS containing high levels of β2AR (18), play a critical role in mediating toxicity of DA neurons in the SN area. Recent studies have shown that activation of nigral microglia and the subsequent release of neurotoxic factors, including the proinflammatory cytokine TNF-α, as well as NO and reactive oxygen species (ROS), are considered key mediators of DA neurodegeneration in PD (11, 19, 20). Because most long-acting β2AR agonists are highly lipophilic and should readily gain access to the brain, it is likely that these compounds could have an immunomodulatory effect on the progression of inflammation in PD patients by inhibiting the activation of microglia. Therefore, we hypothesize that β2AR agonists might well serve as a new class of compounds that could be used as an anti-inflammatory treatment for PD. In this study, we report that long-acting β2AR agonists have anti-inflammatory and DA-neuroprotective properties, even at extremely low doses, and that administration of the long-acting β2AR agonist salmeterol significantly protects DA neurons against LPS and 1-methyl-4-phenyl-1,2,3,6-tetrahydropyridine (MPTP)-induced toxicity both in vitro and in vivo. Mechanistic studies using primary mesencephalic neuron-glia cultures demonstrated that salmeterol, as well as several other long-acting β2AR agonists, exert potent neuroprotection through their inhibition of microglial inflammatory mediator production. Furthermore, we showed that the anti-inflammatory effects of salmeterol seen at these extremely low doses requires the presence of β2AR, are mediated through the inhibition of both MAPK and NF-κB signaling pathways in activated microglia, and function independently of the canonical GPCR/cAMP/protein kinase A (PKA) signaling pathway. These results may suggest a new mode of action for β2AR agonists as a therapeutic in the treatment of chronic inflammatory conditions of the CNS. C57BL/6J mice were purchased from The Jackson Laboratory (Bar Harbor, ME). Timed-pregnant Fisher F344 rats and C57/BL6 mice were obtained from Charles River Laboratories (Raleigh, NC). Congenic BALB/c β2AR-deficient mice were derived from FVB β2AR-deficient mice (Taconic, Hudson, NY). Housing and breeding of the animals were performed in strict accordance with the National Institutes of Health guidelines. Salmeterol was obtained from Tocris Cookson (Ballwin, MO). Rp-cAMPS and cAMP Enzyme Immunoassay Kit was purchased from BIOMOL (Plymouth Meeting, PA). Long-acting compounds including formoterol fumarate dehydrate, bambuterol hydrochloride, and clenbuterol hydrochloride, as well as MPTP and 1-methyl-4-phenylpyridinium (MPP+), were purchased from Sigma-Aldrich (St. Louis, MO). LPS used for in vitro studies (Escherichia coli strain O111:B4) was purchased from Calbiochem (San Diego, CA), and LPS used for in vivo studies was purchased from Sigma-Aldrich. Cell culture reagents were obtained from Invitrogen (Carlsbad, CA). 3H-DA (30 Ci/mmol) was obtained from PerkinElmer Life Sciences (Boston, MA). The polyclonal anti-tyrosine hydroxylase (TH) Ab was a gift from Dr. J. Reinhard (GlaxoSmithKline, Research Triangle Park, NC). The Vectastain avidin/biotin complex kit and biotinylated secondary Abs were purchased from Vector Laboratories (Burlingame, CA). The fluorescence probe dichlorodihydro-fluorescein diacetate (DCFH-DA) was obtained from Calbiochem (La Jolla, CA). Anti–phospho-ERK1/2 Ab, anti-ERK1/2 Ab, anti–phospho-p38 Ab, anti-p38 Ab, anti–phospho-JNK Ab or anti-JNK Ab, anti–phospho-p65 or anti-p65 Ab, and anti-TAK1 Ab were purchased from Cell Signaling Technology (Danvers, MA). Negative control small interfering RNA (siRNA) and β-arrestin2 siRNA are from Invitrogen (Carlsbad, CA). Neuron-glia cultures were prepared from the ventral mesencephalic tissues of embryonic day 14–15 rats or day 13–14 mice, as described previously (21, 22). Briefly, dissociated cells were seeded at 1 × 105/ and 5 × 105/well in poly-d-lysine–coated 96- and 24-well plates, respectively. Cells were maintained at 37°C in a humidified atmosphere of 5% CO2 and 95% air in MEM containing 10% FBS, 10% horse serum, 1 g/l glucose, 2 mM l-glutamine, 1 mM sodium pyruvate, 100 μM nonessential amino acids, 50 U/ml penicillin, and 50 μg/ml streptomycin. Seven-day-old cultures were used for drug treatments. At the time of treatment, immunocytochemical analysis indicated that the rat neuron-glia cultures were made up of 11% microglia, 48% astrocytes, 41% neurons, and 1% TH-immunoreactive (TH-IR) neurons. The composition of the neuron-glia cultures of mice is very similar to that of rats, which consists of 12% microglia, 48% astrocytes, 40% neurons, and 1% TH-IR neurons. Midbrain neuron-enriched cultures were established as described previously (23). Briefly, 24 h after seeding, cytosine β-d-arabinocide was added to a final concentration of 10 μM to suppress glial proliferation. Three days later, the media were removed and replaced with maintenance medium. Cells were used for drug treatments 7 d after initial seeding. Routinely, the 7-d-old neuron-enriched cultures, which normally contain <0.1% microglia and <3–5% astrocytes, were used for treatment. Among the neuronal population (Neu-N immunoreactive neurons), 2.7–3.9% were DA neurons (TH-IR–positive neurons). Rat primary neuron-astroglia cocultures were obtained by suppressing microglial proliferation with 1.5 mM leucine methyl ester 24 h after seeding the cells, as described previously (23). Three days later, cultures were changed back to maintenance medium and used for treatment 7 d after initial seeding. The cultures stained with Iba1 or F4/80 Ab showed <0.1% microglia. Mice microglia-enriched cultures with a purity of >98% were prepared from whole brains of 1-d-old mice pups as described previously (24). For superoxide assays, 105 cells were grown overnight in 96-well culture plates before use. 3H-DA uptake assays were performed as described previously (24). Briefly, cells were incubated for 20 min at 37°C with 1 μM 3H-DA in Krebs-Ringer buffer (16 mM sodium phosphate, 119 mM NaCl, 4.7 mM KCl, 1.8 mM CaCl2, 1.2 mM MgSO4, 1.3 mM EDTA, and 5.6 mM glucose [pH 7.4]). Cells were washed with ice-cold Krebs-Ringer buffer three times, after which, the cells were collected in 1 N NaOH. Radioactivity was determined by liquid scintillation counting. 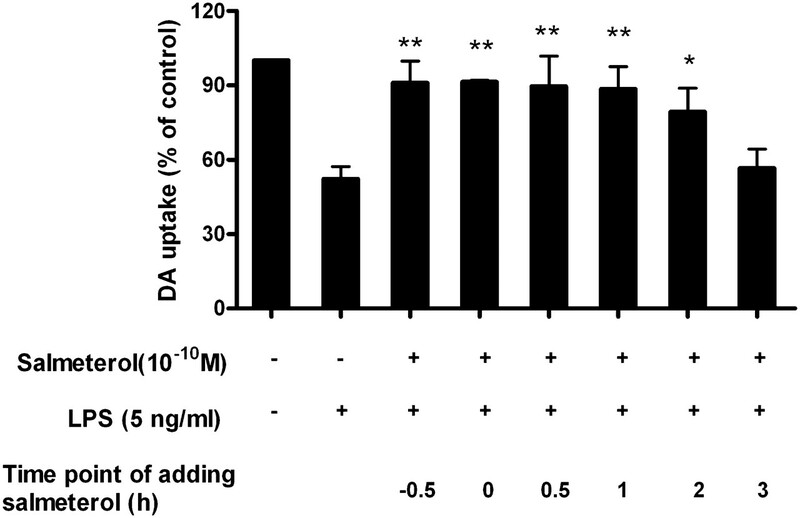 Nonspecific DA uptake observed in the presence of mazindol (10 μM) was subtracted. Immunostaining was performed as described previously (22). Briefly, formaldehyde (3.7%)-fixed cultures were treated with 1% hydrogen peroxide, followed by sequential incubation with blocking solution, after which, the cells were incubated overnight at 4°C with Abs against TH (1/20,000). Cells were incubated with biotinylated secondary Ab for 2 h, followed by incubation with avidin/biotin complex reagents for 40 min. Color was developed with 3,3′-diaminobenzidine. For morphological analysis, the images were recorded with an inverted microscope (Nikon, Tokyo, Japan) connected to a charge-coupled device camera (DAGE-MTI, Michigan City, IN) operated with the MetaMorph software (Universal Imaging, Downingtown, PA). For visual counting of TH-IR neurons, nine representative areas per well of the 24-well plate were counted under the microscope at ×100 magnification by three individuals. The average of these scores was reported. The production of superoxide was determined by measuring the superoxide dismutase (SOD)-inhibitable reduction of water-soluble tetrazolium salt-1 (WST-1) (25, 26). Neuron-glia or microglia-enriched cultures in 96-well culture plates were washed twice with HBSS without phenol red. Cultures were then incubated at 37°C for 30 min with vehicle control (DMSO) or salmeterol in DMSO (50 μl/well). Then, 50 μl HBSS with and without SOD (final concentration, 50 U/ml) was added to each well along with 50 μl WST-1 (1 mM) in HBSS and 50 μl vehicle or LPS (10 ng/ml). To measure superoxide production induced by MPP+, 7-d-old mesencephalic neuron-glia cultures grown in 96-well plates were treated with salmeterol in the presence and absence of MPP+ or vehicle alone in 150 μl phenol red-free treatment medium. Four days after treatment, 50 μl HBSS with and without SOD (final concentration, 50 U/ml) was added to each well along with 50 μl WST-1 (1 mM) in HBSS. Fifteen minutes later, absorbance at 450 nm was read with a SpectraMax Plus microplate spectrophotometer (Molecular Devices, Sunnyvale, CA). The difference in absorbance observed in the presence and absence of SOD was considered to be the amount of superoxide produced, and results were expressed as the percentage of vehicle-treated control cultures. Intracellular ROS (iROS) were determined by using a DCFH-DA assay as previously described with minor modifications (27). DCFH-DA enters cells passively and is deacetylated by esterase to nonfluorescent DCFH. DCFH reacts with ROS to form DCF; the fluorescent product DCFH-DA was dissolved in methanol at 10 mM and was diluted 500-fold in HBSS to yield DCFH-DA at 20 μM. The cells were exposed to DCFH-DA for 1 h and then treated with HBSS containing the corresponding concentrations of LPS for 2 h. The fluorescence was read immediately at wavelengths of 485 nm for excitation and 530 nm for emission using a SpectraMax Gemini XS fluorescence microplate reader (Molecular Devices). The experimental value minus the value of the control group was interpreted as the increase in iROS. The production of NO was determined by measuring the accumulated levels of nitrite in the supernatant with Griess reagent, and the release of TNF-α was measured with a mouse TNF-α−ELISA kit from R&D Systems (Minneapolis, MN) as described previously (23). Enriched microglia were pretreated with vehicle or salmeterol in the presence or absence of LPS, and 15 min later, cells were lysed and collected total protein for assay. Equal amounts of protein (20 μg/lane) were separated by 4–12% Bis-Tris Nu-PAGE gel and transferred to polyvinylidene difluoride membranes (Novex, San Diego, CA). For detection of the phosphorylation of MAPK, membranes were blocked with 5% BSA PBS buffer and washed three times, followed by incubation with anti–phospho-ERK1/2 Ab, anti-ERK1/2 Ab, anti–phospho-p38 Ab, anti-p38 Ab, anti–phospho-JNK Ab, anti-JNK Ab, anti–phospho-TAK1 Ab, or anti-TAK1 Ab at 1/1000 dilution (Cell Signaling Technology, Danvers, MA) overnight at 4°C. Anti-rabbit HRP-linked secondary Ab (1/2000 dilution) was incubated for 1 h at 25°C. The same detection system as above was used. Primary microglia cells were treated with 0 or 10−8 M∼10−11 M salmeterol for 5, 10, and 30 min. Cells were lysed in 0.1 M HCl for 10 min, and the supernatants were used for cAMP assays following the manufacturer’s protocol of cAMP Enzyme Immunoassay Kit from BIOMOL. The absorbance was measured at 405 nm using a colorimetric 96-well plate reader. Data were expressed as picomoles cAMP per 1 million cells. DNA binding assay was performed by using NF-κB (p65) Transcription Factor Assay Kit from Cayman Chemical following the instructions. siRNA duplexes with sequences specifically targeting β-arrestin2 RNA was 5′-UGGUGUCCUACAGGGUCAAGGUGAA-3′ and negative control siRNA (Invitrogen) were transfected into primary mouse microglia cells using an Macrophage Nucleofector (Lonza, Allendale, NJ) and the manufacturer’s buffer kit, and protocol was optimized for mouse macrophage. Knockdown of expression of the target was determined by Western blotting. Three months after a single systemic LPS injection (5 mg/kg, i.p.) (28, 29), continuous infusion of extremely low doses (1∼10 μg/kg/day, delivered s.c. via an Alzet osmotic pump) of salmeterol were administered for 2 wk. Rotarod activity was evaluated at 7 and 10 mo after LPS injection. Ten months after LPS injection, mice were euthanized, and brains were removed and postfixed in 4% paraformaldehyde overnight at 4°C. Brains were then placed into 30% sucrose/PBS solution at 4°C until the brains sank to the bottom of the container. Coronal sections including SN pars compacta (SNpc) were cut on a horizontal sliding microtome into 35-μm transverse free-floating sections. For 6 consecutive days, 8-wk-old C57BL/6 male mice received daily MPTP injections (15 mg/kg MPTP·HCl [14.52 mg/kg as a base], s.c.). Salmeterol (1 or 10 μg/kg/day) was given by continuous infusion (via an Alzet mini-pump) for 2 wk starting at 2 d before the first MPTP injection. Mice used as controls received an equal volume of 0.9% saline. The mice were euthanized 21 d after the last MPTP/saline treatment with an i.p. injection of 120 mg/kg pentobarbital and then perfused through the left ventricle with saline. Mice were divided into two groups: 1) the striatum region was dissected and immediately frozen in dry ice for the analysis of levels of DA and its metabolites (3,4-dihydroxyphenylacetic acid [DOPAC] and homovanillic acid [HVA]) by HPLC. 2) Saline perfusion was followed by 4% paraformaldehyde for immunocytochemical analyses. Brains were removed and postfixed in 4% paraformaldehyde overnight at 4°C. Brains were then placed into 30% sucrose/PBS solution at 4°C until the brains sank to the bottom of the container. Coronal sections including SNpc were cut on a horizontal sliding microtome into 35-μm transverse free-floating sections. The levels of DA and its metabolites (DOPAC and HVA) were determined by HPLC and coupled with electrochemical detection as described previously (30). In brief, striatal tissues were sonicated in 0.2 M perchloric acid (20% w/v) containing the internal standard 3,4-dihydroxybenzylamine (100 ng/ml). After centrifugation, 150 μl of the supernatant was passed through a 0.2-μm Nylon-66 filter, and 25 μl of the filtrate representing 2.5 mg striatal tissue was used. The concentrations of DA, DOPAC, and HVA were calculated using standard curves that were generated by determining, in triplicate, the ratios between three known amounts of the internal standard. The rotorod apparatus (Rotamex, Columbus Instruments, Columbus, OH) was used to evaluate the ability of staying on the rotating rod. Mice were transported (within their home cage) to acclimate to the testing room for 1 h prior to testing started. The parameters of the rotor-rod system include start speed, acceleration, and highest speed (2 rpm, accelerate 2 rpm/10 s, 20 rpm). Each mouse was placed on the confined section of the rod. We then turn on the rotarod, which then begins to rotate with a smooth increase in speed from 2 rpm. Mice received three consecutive trials. The rest period between each trial was 2 min. The mean latency for the three trials was used for the analysis. The latency to fall was measured in seconds. In all trials, if the mouse did not fall from the rod, it was removed from the rod after 2 min. The loss of DA neurons was assessed by counting the number of TH-IR neurons following immunostaining of brain sections. Twenty-four consecutive brain slices (35 μm thickness), which encompassed the entire SNpc, were collected. A normal distribution of the number of TH-IR neurons in the SNpc was constructed based on the counts of 24 slices from C57BL/6J mice. Eight evenly spaced brain slices from saline, LPS-injected, or salmeterol-treated animals were immunostained with an Ab against TH and counted. The distribution of the cell numbers from each animal was matched with the normal distribution curve to correct for errors resulting from the cutting. Samples were counted in a double-bind manner with three individuals. Conclusions were drawn only when the difference was within 5%. Microglia were counted as described previously (31). Briefly, three vertical and horizontal lines were drawn in equal intervals in each well of the 24-well plate. For quantification of microglia, nine representative areas (0.9 × 0.7 mm/field) per well at the line intersections were focused, and 81 fields from three independent experiment in triplicate were selected at ×100 magnification by using Nikon Diaphot equipped with Dage-MTI (DC 330) camera with MetaMorph software. The number of Iba-1–positive microglia was counted. Counting was performed in a double-blind manner by three individuals, and conclusions were drawn only when the difference was within 5%. The data were presented as the means ± SE. For multiple comparisons of groups, two-way or three-way ANOVA was used. Statistical significance between groups was assessed by paired Student t test, followed by Bonferroni correction using the JMP program (SAS Institute, Cary, NC). A p value <0.05 was considered statistically significant. Because β2AR agonists have been shown to have potent anti-inflammatory effects on a number of different chronic inflammatory conditions, we explored whether β2AR agonists are neuroprotective against inflammation-induced toxicity of DA neurons (Fig. 1). On the basis of the blood t1/2, β2AR agonists were classified into short acting (serum t1/2, 3–4 h) and long acting (serum t1/2, ∼12 h) (32, 33), and both types were tested in this study. Mesencephalic neuron-glia cultures were pretreated with either short-acting β2AR agonist salbutermol (Fig. 1A) or long-acting β2AR agonists bambuterol (Fig. 1B), clenbuterol (Fig. 1C), formoterol (Fig. 1D), and salmeterol (Fig. 1E–G) at a wide range of concentrations (10−7–10−12 M) for 30 min prior to the addition of LPS. Seven days later, LPS-induced DA neurotoxicity was quantified by measuring DA neuronal function using the 3H-DA uptake assay (Fig. 1A–E), by counting the number of TH-IR neurons (Fig. 1F), or by morphological analysis of TH-IR neurons (Fig. 1G). The 3H-DA uptake assay showed that salbutermol (the short-acting β2AR agonist) can protect DA neurons only at concentrations of 10−7 and 10−8 M (Fig. 1A), whereas long-acting β2AR agonists clenbuterol, bambuterol, formoterol, and salmeterol can protect DA neurons from LPS-induced toxicity at concentrations ranging from 10−7 down to 10−10 M (Fig. 1B–E). These results demonstrate that the neuroprotective effects of short-acting β2AR are ∼100- to 1000-fold less potent than long-acting compounds. Because of the slightly higher potency of salmeterol against LPS-induced DA neurotoxicity when compared with the other long-acting agonists (Fig. 1E), and its wide usage as a clinical treatment for asthma and COPD, we used salmeterol as our prototype long-acting β2AR agonist for further studies in this paper. Similar protective effects on DA neurons were observed with salmeterol when we quantified the number of TH-IR neurons remaining in culture after 7 d with immunostaining (Fig. 1F). Morphological analysis revealed that LPS treatment not only decreased the number of TH-IR neurons but also caused a loss of neuronal processes, and these characteristics were also reversed by low doses of salmeterol pretreatment in a concentration-dependent manner (Fig. 1G). Low doses of β2AR agonists protect DA neurons against LPS-induced toxicity. Rat primary mesencephalic neuron-glia cultures were seeded in a 24-well culture plate at 5 × 105, then pretreated with vehicle or indicated concentrations of β2AR agonists, including short-acting β2AR agonist salbutermol (A), long-acting β2AR agonists bambuterol (B), clenbuterol (C), formoterol (D), and salmeterol (E–G) for 30 min before the addition of 5 ng/ml LPS. Seven days later, the LPS-induced DA neurotoxicity was quantified by the 3H-DA uptake assay (A–E); the immunocytochemical analysis of salmeterol and LPS-treated cells, including TH-IR neuron counts (F) and the representative pictures of TH+ neuron immunostaining (G). Results in A–E were expressed as a percentage of the vehicle-treated control cultures and were the means ± SE from three independent experiments in triplicate. *p < 0.05, **p < 0.01 compared with the LPS-treated cultures. Scale bar, 50 μm. In addition to the pretreatment studies, a post-treatment of salmeterol was performed. Salmeterol at 10−10 M was added to neuron-glia cultures 30 min prior, simultaneously with, or 30 min, 1 h, 2 h, and 3 h following the addition of LPS, and DA-neurotoxicity was measured 7 d later. We chose the 10−10 M concentration of salmeterol for these experiments because this was the lowest consistently effective concentration of salmeterol and other long-acting agonists that provided optimal neuroprotection in our pretreatment studies. The results in Fig. 2 showed that when salmeterol was added up to 2 h after LPS treatment, significant neuroprotection of TH-IR neurons was observed. We also observed that the production of inflammatory mediators was inhibited by the addition of salmeterol up to 2 h post-LPS treatment (data not shown). However, when salmeterol was added 3 h post-LPS treatment, no significant neuroprotection or inhibition of inflammatory mediator production was observed. These results demonstrate that the addition of salmeterol within the first few hours following exposure to LPS is critical in determining the survival of DA neurons. Salmeterol mediates neuroprotection when administered prior to or after exposure to LPS. Rat primary mesencephalic neuron-glia cultures were seeded in a 24-well culture plate at 5 × 105, and vehicle or salmeterol at 10−10 M was added to neuron-glia cultures 30 min prior to, simultaneously with, 30 min, 1 h, 2 h, or 3 h following the addition of LPS. DA neurotoxicity was measured 7 d later. Results were expressed as a percentage of the vehicle-treated control cultures and were the means ± SE from three independent experiments in triplicate. *p < 0.05, **p < 0.01 compared with the LPS-treated cultures. 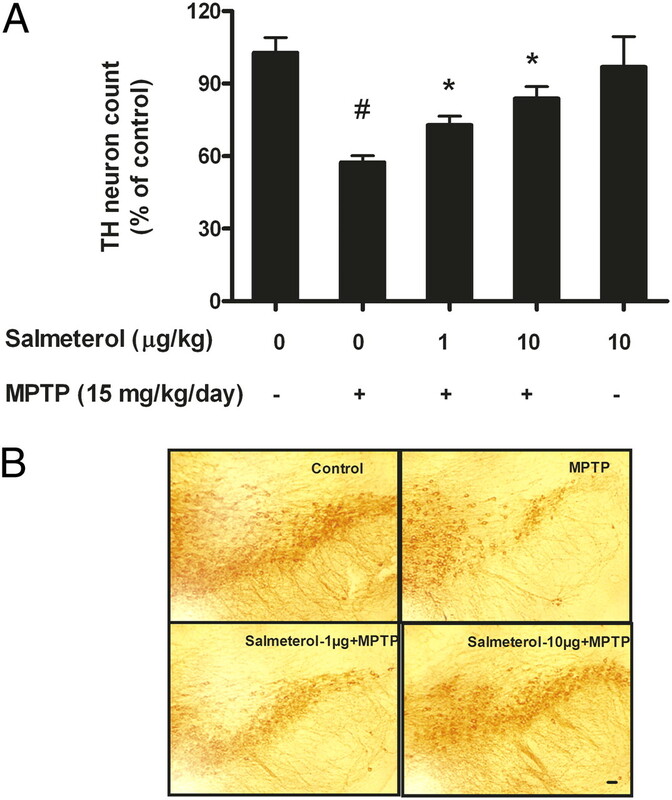 The neuroprotective effect of salmeterol was further studied using MPP+, the active metabolite of MPTP, as the initiator of DA neurotoxicity in neuron-glia cultures (34). MPP+ is known to kill DA neurons directly, and our previous work has shown that neuronal death induced by MPP+ is the result of both direct cytotoxic effects on DA neurons by MPP+, as well as by reactive microgliosis induced by toxic factors released by dying neurons (11, 34). Treatment with 0.2 μM MPP+ for 7 d resulted in a 74% decrease in DA neuron function in neuron-glia cultures, and pretreatment with 10−10 M salmeterol restored significant but not complete DA neuronal function in these cultures (Fig. 3). To further determine how salmeterol protects DA neurons from the cytotoxic effects of MPP+, we treated cultures of rat midbrain lacking all glial cells (neuron-enriched cultures) or cultures containing only neurons and astrocytes but not microglia (neuron-astrocyte cultures) and measured DA neurons function 7 d after treatment. Our results show that salmeterol was not capable of protecting DA neurons from MPP+-induced toxicity in either the neuron-enriched cultures or the neuron-astrocyte cultures (Fig. 3). These results demonstrate that microglia, not neurons or astroglia, serve as the target of a salmeterol-mediated effect against MPP+-induced toxicity and might function by inhibiting the reactive microgliosis or by mediating direct neuroprotection elicited from MPP+-induced DA neuronal toxicity. Salmeterol-mediated neuroprotection is microglia dependent. Mesencephalic midbrain neuron-glia cultures (open bars, NG, which contain ∼10% microglia), neuron-enriched cultures (solid bars, N, which contain <0.1% microglia) and neuron-astrocyte cultures (cross-hatched bars, NA, which contain <0.1% microglia) were pretreated with either vehicle or 10−10 M salmeterol for 30 min prior to the addition of 0.2 μM MPP+. The 3H-DA uptake measurements were performed 7 d following MPP+ treatment. Results were expressed as a percentage of the vehicle-treated control cultures and were the means ± SE from three independent experiments in triplicate. *p < 0.05 compared with the MPP+-treated cultures. Because low doses of salmeterol shows potent DA-neuroprotective effects in vitro, two different animal PD models were used for the substantiation of in vivo efficacy of salmeterol in preventing DA neurodegeneration. The first one is the MPTP model, initially used in this study to validate the therapeutic efficacy of salmeterol (30). Mice received daily injections of MPTP (15 mg/kg, s.c.) for 6 consecutive days. Experimental mice were also given either saline or two different doses of salmeterol (1 or 10 μg/kg/day) by continuous infusion (via an Alzet mini-pump) for 2 wk starting 2 d before the first MPTP injection. Three weeks following the last MPTP injection, mice were euthanized for morphologic analysis. MPTP-injected mice displayed a 50% loss of TH-positive neurons (DA neurons) in SNpc compared with saline-injected controls, and this decrease was significantly prevented by treatment with both doses of salmeterol (Fig. 4A). In addition, the loss of DA neurites in the pars reticulata region of SN by injection of MPTP was also fully protected by salmeterol treatment (Fig. 4). In addition to the analysis of DA neurons in the SN, levels of DA and its metabolites DOPAC and HVA were measured in the striatum, the region containing DA nerve terminals projected from the SN. Six consecutive daily MPTP injections reduced the DA level by ∼65% compared with saline injected group (Table I). Although salmeterol treatment did not prevent the loss of DA levels caused by MPTP, interesting results were observed with the turnover rate of DA (expressed by the ratio of DA and its metabolites), which reflect the functional status of the DA release. Both doses of salmeterol treatment (1 and 10 μg/kg/day) showed much higher turnover rates than those of either the saline- or MPTP-treated groups. 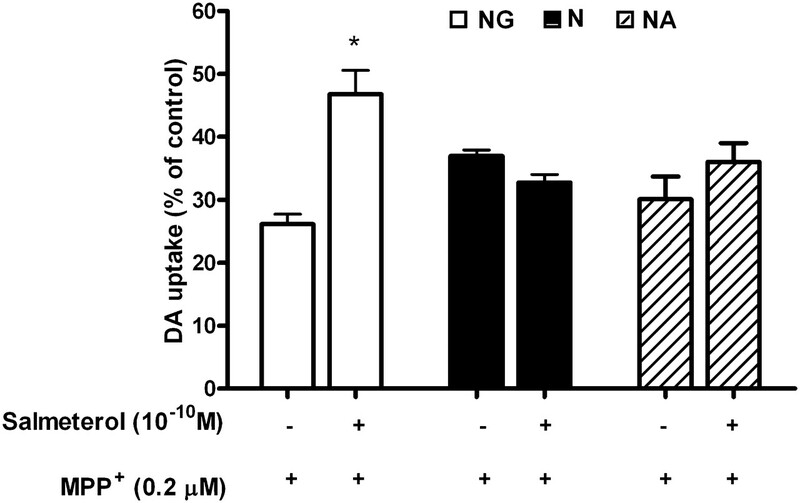 These results suggest that salemeterol, because of its protective effect on cell bodies of DA neurons in the SN, was able to preserve and maintain higher activity of DA neurons. Therefore, similar to our previous report (30), it is highly likely that as long as the nigral DA neuronal bodies are preserved by the neuroprotective agents, the DA levels eventually will return to normal values. Salmeterol was also capable of inhibiting progressive DA neurodegeneration induced by injection of the neurotoxin MPTP. To induce DA neurodegeneration, MPTP (15 mg/kg) was injected s.c. into C57BL/6J mice for 6 consecutive days. Experimental mice (eight mice per group) were also given either saline or doses of salmeterol at 1 or 10 μg/kg/day by continuous infusion (via an Alzet mini-pump) for 2 wk starting 2 d before the first MPTP injection. We then assessed the survival of DA neurons in the SNpc 21 d after the last MPTP injection through quantification of TH-positive neurons (A). Representative pictures of TH-IR neurons staining for different treatment groups are shown (B). *p < 0.05, compared with the LPS-treated mice; #p < 0.05, compared with saline-treated mice. Scale bar, 50 μm. A second PD model is the chronic inflammatory-based LPS model. Our previous observations have shown that a single systemic injection of LPS elicits a time-dependent inflammatory-mediated progressive loss of DA neurons in the SN and a concomitant loss of motor activity (28, 29). Three months after a single injection of LPS (5 mg/kg, i.p. ), the mid-time point between this LPS injection and any observable DA-neuronal degeneration, C57BL/6J mice were infused with either saline alone or salmeterol given at two different doses (1 or 10 μg/kg/day) for a period of 2 wk via an Alzet mini-pump. Eight months after the LPS injection, rotarod behavioral tests were performed and again at 10 mo when mice were killed for histological analysis (Fig. 5A). Treatment with salmeterol at 10 μg/kg/day significantly protected the LPS-treated mice from motor deficits measured by rotarod activity at both 8 and 10 mo, whereas the 1 μg/kg/day dose showed significant protection at 8 mo but not 10 mo (Fig. 5B). We further observed that salmeterol treatment significantly prevented LPS-induced loss of cell bodies and processes of DA neurons within the SNpc at 10 mo (Fig. 5C, 5D). Taken together, our data showed that a salmeterol treatment significantly attenuates the loss of DA neurons in the SNpc induced by the injection of either MPTP or LPS in vivo. 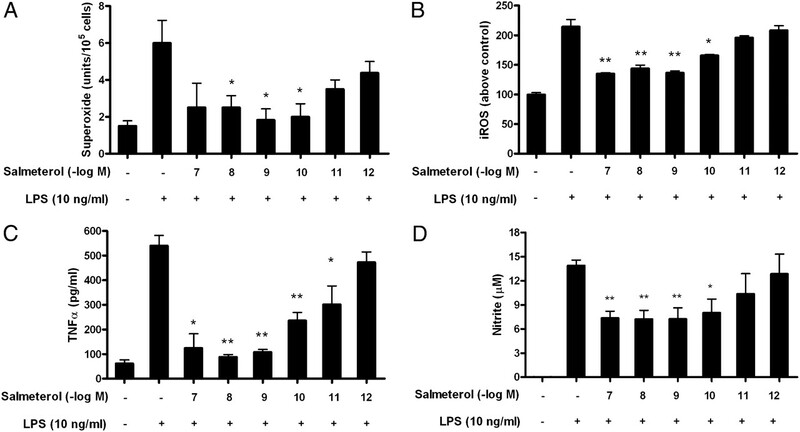 Salmeterol significantly attenuates the loss of rotarod activity and DA neurons in SNpc induced by systemic LPS injection. C57BL/6J mice received a single LPS injection (5 mg/kg, i.p. ), and 3 mo later, mice were infused with either vehicle alone or salmeterol (1 or 10 μg/kg/day) for 2 wk (via an Alzet mini-pump). Eight months and 10 mo after LPS injection, rotarod tests were performed (A, B), and then at 10 mo, mice were sacrificed, brains were harvested and sectioned, and 24 sections (rostral to caudal, 4.52–5.36 mm posterior to bregma) were collected as described in Materials and Methods. Eight evenly spaced brain sections from vehicle, LPS-injected, or LPS-injected salmeterol-treated animals were immunostained with anti-TH Ab, and the number of TH-IR neurons in the SN was counted. Data were expressed as percent loss compared with saline-injected controls (C). Representative pictures of TH-IR neurons staining for different treatment groups are shown (D). *p < 0.05, compared with the LPS-treated mice; #p < 0.05, compared with saline-treated mice. Scale bar, 50 μm. Activation of microglia either through the direct effects of LPS on microglia or by reactive microgliosis via the death of neurons produces an array of proinflammatory mediators, including ROS, TNF-α, and NO, which are the pivotal products that mediate inflammation-mediated neurotoxicity (11, 35). To determine whether salmeterol affects the generation of inflammatory mediators, primary microglia were pretreated with salmeterol before the addition of LPS. At concentrations from 10−7 to 10−10 M but not 10−11 and 10−12 M, salmeterol significantly reduced LPS-mediated superoxide production (Fig. 6A), iROS production (Fig. 6B), TNF-α (Fig. 6C), and NO (Fig. 6D), respectively. The inhibition of LPS-induced production of proinflammatory factors by salmeterol was not due to lower numbers of microglia, because microglial cell counts based on Iba-1 immunostaining showed that salemterol had no effect on the absolute number of microglia over the 7-d culture period (data not shown). These results show that low-dose salmeterol can specifically inhibit LPS-induced activation and proinflammatory mediator production by microglia but had no effect on microglia viability. Interestingly, other long-acting β2AR agonists including bambuterol, fomoterol, and clenbuterol also show the similar pattern in the inhibition of the production of the proinflammatory mediators TNF-α and NO from microglia, whereas short-acting agonist salbutermol failed to inhibit TNF-α and NO production at 10−9 M (Supplemental Fig. 1). 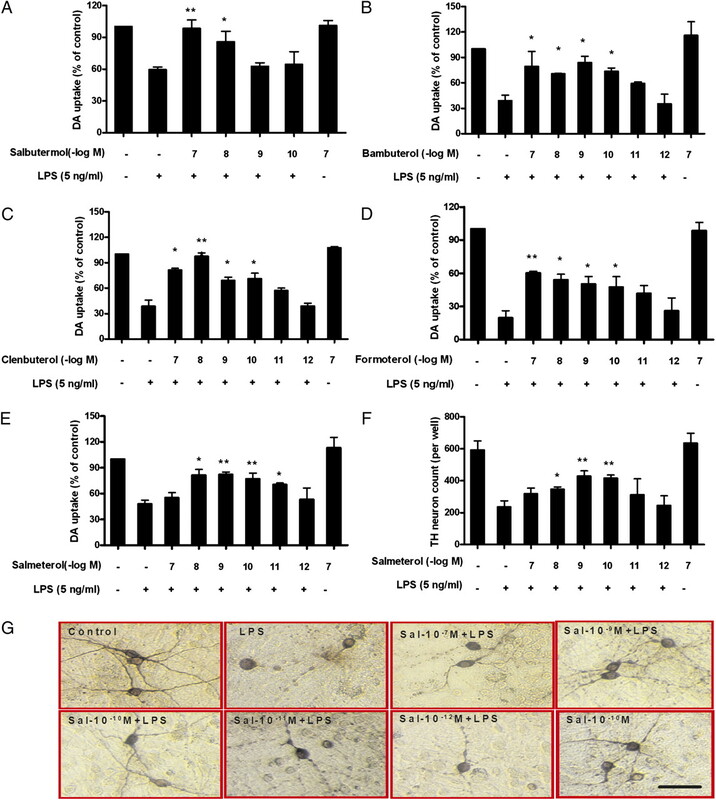 Effect of salmeterol on LPS-induced production of proinflammatory factors from microglia. Microglia-enriched cultures were seeded at a density of 1 × 105/well. Cells were pretreated with vehicle or various concentrations of salmeterol for 30 min, followed by the addition of LPS. The production of LPS-induced extracellular superoxide production (A) was measured as SOD-inhabitable reduction of WST-1. LPS-induced iROS was determined by probe DCFH-DA (B). Salmererol’s effect on LPS-induced production of TNF-α and nitrite were shown in C and D. Results were expressed as mean ± SE from three to five independent experiments in triplicate. *p < 0.05, **p < 0.01, compared with the LPS-treated cultures. Previous reports have shown that anti-inflammatory responses of higher concentrations of β2AR agonists (between 10 nM and 10 μM) are mediated through the activation of the β2AR and its induction of cAMP (2, 4, 5, 36). Because much lower concentrations of β2AR agonists were examined in this study, a series of experiments were conducted aimed at elucidating the signaling pathway underlying the anti-inflammatory effect of salmeterol on microglial cells. For this purpose, TNF-α production was used as the prototype of the inflammatory response induced by LPS. We first measured TNF-α production from microglial cultures generated from β2AR-deficient or wild-type mice to determine whether low-dose salmeterol inhibition was β2AR dependent. Results show that although salmeterol displayed a concentration-dependent inhibition of TNF-α production in wild-type mice (Fig. 7A), this β2AR agonist completely lost its inhibitory effect on TNF-α production from the β2AR-deficient microglia (Fig. 7B). β2AR activation normally leads to intracellular production of cAMP, resulting in the activation of the catalytic subunit of PKA (37). Surprisingly, enriched primary microglia from wild-type mice did not produce detectable cAMP after treatment with salmeterol at concentrations 10−10 M or lower, whereas microglia treated with doses of 10−8 M or 10−9 M salmeterol produced detectable cAMP after treatment (Fig. 7C). Furthermore, we found that the PKA inhibitors Rp-cAMP and H89 failed to abolish the inhibitory effects of low-dose salmeterol (10−10 M) on the LPS-induced production of TNF-α (Fig. 7D) or nitrite (Supplemental Fig. 2A) in microglia. In addition to the stimulation of PKA, other effectors can also be activated by cAMP signaling including a small family of guanine nucleotide exchange factors also known as an exchange protein directly activated by cAMP (EPAC) (38). Furthermore, pretreatment with an EPAC agonist, 8CPT-2′-O-Me-cAMP, did not inhibit the LPS-induced production of TNF-α (Fig. 7E) or nitrite (Supplemental Fig. 2B), and it did not significantly alter the salmeterol-mediated inhibition of microglial activation, indicating EPAC activation does not play a role in the salmeterol-mediated anti-inflammatory response. Because low-dose salmeterol did not appear to activate the canonical β2AR/cAMP signaling pathway, we then investigated whether salmeterol’s effects were mediated through β-arrestin2, a known negative regulator of inflammatory responses in monocytes and macrophages (39, 40). To test this possibility, primary microglia were transfected with control or β-arrestin2–specific siRNA, treated with the indicated concentrations of salmeterol, then exposed to LPS. 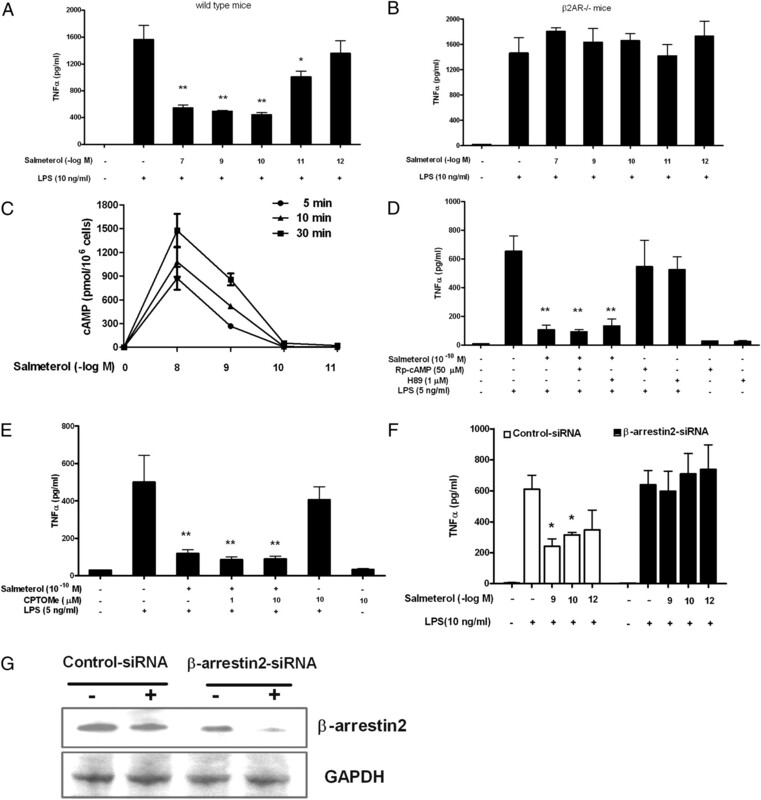 We found that the anti-inflammatory effects of salmeterol were abolished by the siRNA-mediated knockdown of β-arrestin2 but not in the control siRNA-treated cells (Fig. 7F). Western blot analysis demonstrated the efficiency of siRNA knockdown (Fig. 7G). Taken together, these data strongly suggest that low-dose salmeterol-mediated anti-inflammatory effects are dependent on β2AR/β-arrestin2 but independent of the cAMP/PKA and cAMP/EPAC pathways. Low-dose salmeterol-mediated anti-inflammatory effects are β2AR/β-arrestin2 dependent but cAMP/PKA and cAMP/EPAC independent. Microglia culture prepared from C57BL/6 (A) or β2AR-deficient mice (B) were pretreated with vehicle or indicated concentrations of salmeterol for 30 min prior to the addition of LPS. Supernatant were collected at 3 h after LPS addition for TNF-α analysis (A, B). C, Enriched primary microglia were incubated with vehicle or indicated concentrations of salmeterol at 37°C for 5, 10, or 30 min. After incubation, the cells were lysed, and cAMP levels were determined using a cAMP assay kit. Data were expressed as picomoles cAMP per 1 million cells (C). D and E, Enriched primary microglia cells were pretreated with vehicle or PKA inhibitors, including H89 (1 μM for 45 min), Rp-cAMP (50 μM for 45 min) (D), or EPAC agonist 8CPT-2′-O-Me-cAMP (CPTOMe) (10 μM for 45 min) (E) prior to stimulation with salmeterol (10−10 M) and LPS (5 ng/ml). Supernatants were collected 3 h after LPS addition to measure TNF-α levels. F and G, Primary microglia cells were transfected with 100 pmol specific β-arrestin2 siRNA or control siRNA, and 48 h after transfection, cells were treated with indicated concentrations of salmeterol for 30 min prior to addition of LPS. Supernatants were collected for TNF-α assay (F). Knockdown of expression of the β-arrestin2 was determined by Western blot analysis (G). Results in A–F were expressed as mean ± SE from three to four independent experiments in triplicate. *p < 0.05, **p < 0.01, compared with the LPS-treated cultures. It has been previously shown that β2AR-dependent responses mediated by agonists at micromolar concentrations exert their anti-inflammatory effect primarily through the inhibition of NF-κB. However, the target(s) of the anti-inflammatory activity we observed at doses of 10−10 M salmeterol are not known. Thus, we investigated whether this low dose of salmeterol showed any inhibitory effect on the major LPS-induced proinflammatory pathways, namely MAPK and NF-κB (Fig. 8). 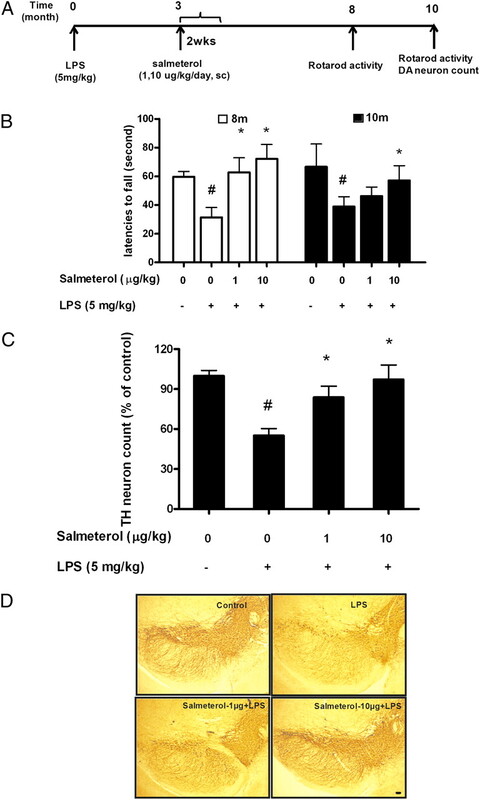 Primary microglia cells were pretreated with salmeterol at concentrations ranging from 10−9 to 10−12 M, then followed by stimulation with LPS for 15 min. ERK1/2, p38, and JNK were all phosphorylated in microglia following LPS stimulation (Fig. 8A), and the phosphorylation of ERK1/2, p38, and JNK were all significantly reduced by pretreatment with salmeterol at concentrations of 10−9–10−10 M but not 10−12 M. Salmeterol at 10−10 M also reduced the phosphorylation of p65–NF-κB (Fig. 8B) and the LPS-induced NF-κB nuclear translocation and binding to the κB site (Fig. 8C). Identical results were seen when TNF-α rather than LPS was used to activate microglial cells [i.e., NF-κB nuclear translocation and κB-binding were inhibited by low-dose salmeterol (Fig. 8D)], suggesting this inhibition was not specific for the TLR4-mediated pathway. Because TAK1 is the converging target for LPS- and TNF-α–elicited activation of both the MAPK and NF-κB pathways, we investigated whether TAK1 phosphorylation induced by LPS stimulation of microglial cells was inhibited by salmeterol. The results show that salmeterol at concentrations of 10−9 and 10−10 M inhibited the LPS-induced phosphorylation of TAK1 (Fig. 8E, 8F), suggesting that low-dose salmeterol-mediated potent anti-inflammatory effects are through the inhibition of TAK1-mediated MAPK and NF-κB signaling pathways. 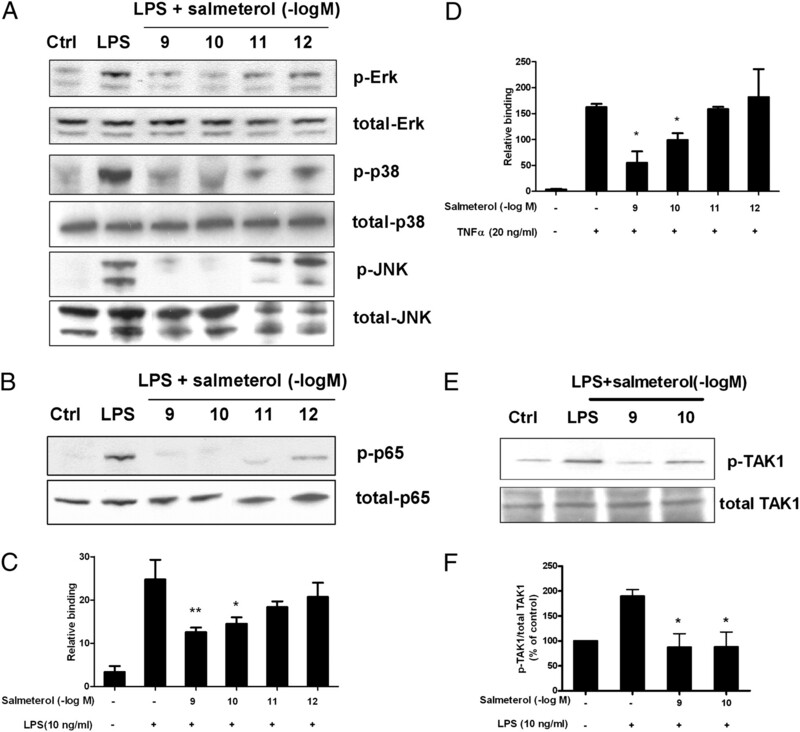 Salmeterol significantly suppresses LPS-induced MAPK and NF-κB activation through inhibition of TAK-1 phosphorylation. Enriched microglia were pretreated with vehicle or salmeterol (10−9–10−12 M) for 30 min, followed by treatment with LPS (10 ng/ml) for 15 min. Cells were then harvested, and the amounts of phosphorylated and total MAPK (ERK1/2, p38, and JNK1/2) (A) and phosphorylated and total NF-κB p65 (B) were determined by Western blot analysis, respectively. Representative Western blots for ERK1/2, p38, JNK, and p65 phosphorylation are shown from three independent experiments. C and D, Primary microglia were pretreated with salmeterol (10−9–10−12 M) for 30 min and then treated with LPS (C) or TNF-α (D) for 30 min. Nuclear extracts were prepared from these cells, and NF-κB (p65) DNA binding activity was detected using the NF-κB (p65) Transcription Factor Assay Kit. E and F, Enriched microglia were pretreated with vehicle or salmeterol (10−9–10−10 M) for 30 min, followed by the treatment with LPS (10 ng/ml) for 15 min, cells were then harvested, and the amounts of phosphorylated TAK1 and total TAK1 are show in Western blot analysis using specific Abs (E). ImageJ software was used to quantitate the intensity of the phosphorylated TAK1 and total TAK1 bands in Western blot, and the results given in F represent the percentage difference of the ratio of phosphorylated TAK1 compared with total TAK1 normalized to the vehicle-treated control (F). One of the most salient features in this report is the finding that long-acting β2AR agonists exhibit potent neuroprotective and anti-inflammatory effects at concentrations 100-fold less than have been found previously to have specific biological activity. Using well-established LPS- and MPP+-mediated in vitro and in vivo PD models, we demonstrated that β2AR agonists are protective against inflammation-induced degeneration of DA containing neurons and that this protection is mediated through the β2AR-mediated inhibition of microglial activation and its proinflammatory factors production. Mechanistic studies demonstrate that this low-dose salmeterol-mediated potent anti-inflammatory effect is mediated through the inhibition of the phosphorylation of MAPK and p65 NF-κB in activated microglia and function independent of the conventional GPCR/cAMP/PKA or GPCR/cAMP/EPAC signaling pathways; rather, this inhibition is dependent on the expression of β-arrestin2, which suggests a novel mode of action for the long-acting β2ΑR agonists in regulating CNS inflammatory conditions. Long-acting β2AR agonists including salmeterol are now currently in use for the treatment of chronic pulmonary diseases such as asthma and COPD (8, 9). Our data proposes a new indication for this class of compounds in the treatment of chronic neurodegenerative diseases such as PD. This possibility is based on the efficacy of salmeterol shown in two different in vivo PD models, a subacute neurotoxin MPTP model and a chronic inflammatory LPS model. Interestingly, our results showed that salmeterol displays protective effects in both of these PD models, even though the mode of action of these two toxins is different. In the LPS model, we have previously reported that a single systemic injection produces chronic neuroinflammation, which results in delayed, progressive motor deficits and selective loss of nigral DA neurons over a period of 7–10 mo (28, 29). Our in vitro studies have shown that the most likely mechanism of this chronic LPS-mediated neurodegeneration is through the activation of microglia, which results in the acute production of inflammatory mediators. This initial acute inflammatory response results in the generation of dying or damaged neurons, which in turn release toxic substances to further activate microglia through a process called “reactive microgliosis,” which causes additional neurodegeneration (41). Thus, between microglia activation and neuronal death, a vicious, self-propelling cycle is formed and drives progressive neurodegeneration (34). It is interesting to note that 3 mo after LPS injection, a 2-wk treatment with extremely low dose of salmeterol (1–10 μg/kg/day) is sufficient to achieve neuroprotection and improvement of motor deficits. This finding lends further credence to the notion that breaking the vicious cycle of inflammation-mediated neurodegeneration in the diseased brain is a new and efficient therapy for the treatment of PD and perhaps other long-term chronic neurodegenerative diseases (34). Equally potent efficacy of salmeterol’s action in protecting against DA neurodegeneration was also observed in MPTP model. It is interesting to note that MPTP initially exerts a specific neurotoxic effect on DA neurons, and our studies show that salmeterol has no direct protective effect on DA neurons against MPP+-mediated toxicity (Fig. 3). This finding, and our previous work (42), suggests that a significant amount of neurodegeneration seen in the MPTP model is mediated by microglia-mediated inflammatory killing, and one possible mechanism underlying salmeterol-elicited protection is through inhibition of reactive microgliosis. This observation is consistent with previous results both from our laboratory and from others using anti-inflammatory therapies such as NF-κB inhibitors (43), regulatory T cells (44, 45), or anti-inflammatory cytokines (46) to prevent MPTP-mediated neurodegeneration. In summary, both our in vivo and in vitro results clearly demonstrate that, despite the difference in the mode of action, salmeterol displays potent neuroprotection in both LPS and MPTP-induced PD models. On the basis of these findings, we propose that the anti-inflammatory effect of low-dose long-acting β2AR agonists is capable of inhibiting both MPTP-induced reactive microgliosis and LPS-induced acute microglial activation and ultimately suppress neuroinflammation that mediates chronic neurodegeneration in PD. Increasing evidence from both in vivo and in vitro studies suggest that β2AR agonists possess important immunomodulatory potential. Our studies provide a novel pathway that is different from the conventional cAMP/PKA/NF-κB–dependent pathway mediated by β2AR activation. These findings also provide opportunities for novel therapeutic approaches in inflammation-mediated CNS disorders such as PD. Although bronchodilation occurs via the classical β2AR/cAMP/PKA pathway (47), it is clear that low dose salmeterol-mediated anti-inflammatory and neuroprotective effects are not PKA or EPAC dependent because PKA inhibitors could not block the anti-inflammatory activity of salmeterol, and EPAC agonists could not mimic their anti-inflammatory effect (Fig. 7D, 7E). For this reason, we looked for an alternative pathway mediating salmeterol-related protective effects. Arrestins, originally discovered as terminators of GPCR signaling by facilitating desensitization and internalization of β2AR, recently have been recognized as multifunctional adaptor/scaffold proteins in regulating cellular processes such as chemotaxis, apoptosis, metastasis, and inflammation (40, 48, 49). β-Arrestin2 has been found to be a negative regulator of inflammatory responses in monocytes and macrophages (39, 40), but its role in microglia remains unknown. Our studies demonstrate that low doses of salmeterol-mediated anti-inflammatory effects are dependent on the expression of both β2AR and β-arrestin2, which suggests a novel GPCR-coupled signaling pathway may be involved and suggests β-arrestin2 may represent a new target for anti-inflammatory therapy. Previous results have shown that β2AR agonists are known to activate MAPKs via both Gs-dependent and Gs-independent mechanisms, and we have previously found that a Gs-independent increase in phosphorylation of ERK occurred following high doses of salmeterol treatment (10−5–10−6 M) in RAW264 macrophage cells and primary microglia cells (50), which mediated a proinflammatory and neurotoxic effect (51). Conversely, we found that much lower doses of salmeterol (10−10–10−11M) have no proinflammatory effect but rather shows dramatic inhibition of MAPK molecules ERK, JNK, and p38 in primary microglia when these cells are activated by LPS. Although both effects appear to work independently of PKA activation, the proinflammatory effect of high-dose salmeterol is through the activation of the cAMP/EPAC pathway, and the inhibitory effect of low-dose salmeterol is independent of cAMP induction as well as PKA and EPAC activity. In addition, low doses of salmeterol had a significant inhibitory effect on the LPS-mediated activation of NF-κB and the production of inflammatory mediators normally under NF-κB regulation such as TNF-α and NO. However, it appears that the anti-inflammatory action of salmeterol may be selective only for certain proinflammatory pathways in microglial cells, because low-dose salmeterol was able to inhibit the activation of superoxide production by LPS but not by PMA (data not shown). Therefore, it appears that low-dose salmeterol can be potently but selectively anti-inflammatory in microglial cells by targeting the MAPK and NF-κB signaling pathways following LPS activation. The neuroprotective effects of β2AR activation by higher doses of β2AR agonists have been reported in other conditions such as amyotrophic lateral sclerosis (52), cerebral ischemic (53), and spinal cord injury-induced locomotor dysfunction (54). Although it is not yet clear how the β2AR agonists exhibit all these neuroprotective properties, several studies suggested that β2AR agonists function to stimulate glutathione-dependent antioxidant processes from nerve cells (54), and others reported that neurotrophic factors from activated astocytes induced by β2AR agonists contribute to neuroprotection (55, 56). We propose that the major neuroprotective activity of β2AR agonists in this study was due to their anti-inflammatory properties. Our results clearly show that the effectiveness of the β2AR agonist salmeterol and the other long-acting β2AR agonists at the low concentrations tested in this paper is due to their anti-inflammatory effect on microglia and not to a direct protective effect on DA-neurons or through an astrocyte-dependent effect (Fig. 3). Given the effectiveness of these compounds at such low concentrations in inhibiting inflammatory responses, they appear to have significant potential in regulating CNS inflammation and the treatment of chronic inflammatory disorders of CNS. We thank Drs. Robert Langenbach and Robert Oakley at the National Institute on Environmental Health Sciences for helpful suggestions for this paper. This work was supported by National Institutes of Health Grant DE-13079 from the National Institute for Dental and Craniofacial Research and a grant from the Michael J. Fox Foundation. This work was also supported in part by the Intramural Research Program of the National Institutes of Health/National Institute on Environmental Health Sciences.
. 1986. Catecholamine-induced suppression of interleukin-1 production. Lymphokine Res. 5: 239–247.
. 1994. Noradrenaline inhibits lipopolysaccharide-induced tumor necrosis factor and interleukin 6 production in human whole blood. Infect. Immun. 62: 2046–2050.
. 1995. Anti-inflammatory activity of salmeterol: down-regulation of cytokine production. Clin. Exp. Immunol. 99: 461–466.
. 1992. Regulation of tumor necrosis factor production by adrenaline and β-adrenergic agonists. J. Immunol. 148: 3441–3445.
. 2000. β-Adrenergic agonists exert their “anti-inflammatory” effects in monocytic cells through the IκB/NF-κB pathway. Am. J. Physiol. Lung Cell. Mol. Physiol. 279: L675–L682.
. 2006. It takes nerve to tell T and B cells what to do. J. Leukoc. Biol. 79: 1093–1104.
. 1997. β2-Agonists prevent Th1 development by selective inhibition of interleukin 12. J. Clin. Invest. 100: 1513–1519.
. 2004. The role of long-acting bronchodilators in the management of stable COPD. Chest 125: 249–259.
. 2009. Salmeterol/fluticasone propionate: a review of its use in asthma. Drugs 69: 1799–1828.
. 1996. Mechanisms of impaired β-adrenoceptor-induced airway relaxation by interleukin-1β in vivo in the rat. J. Clin. Invest. 98: 1780–1787.
. 2005. Microglia and inflammation-mediated neurodegeneration: multiple triggers with a common mechanism. Prog. Neurobiol. 76: 77–98.
. 2008. Why neurodegenerative diseases are progressive: uncontrolled inflammation drives disease progression. Trends Immunol. 29: 357–365.
. 2007. Neuroinflammation in the pathophysiology of Parkinson’s disease: evidence from animal models to human in vivo studies with [11C]-PK11195 PET. Mov. Disord. 22: 1852–1856.
. 2003. Parkinson’s disease: mechanisms and models. Neuron 39: 889–909.
. 1988. Reactive microglia are positive for HLA-DR in the substantia nigra of Parkinson’s and Alzheimer’s disease brains. Neurology 38: 1285–1291.
. 2000. Changes in cytokines and neurotrophins in Parkinson’s disease. J. Neural Transm. Suppl. 60: 277–290.
. 1994. Interleukin-1β, interleukin-6, epidermal growth factor and transforming growth factor-α are elevated in the brain from parkinsonian patients. Neurosci. Lett. 180: 147–150.
. 2002. Existence of functional β1- and β2-adrenergic receptors on microglia. J. Neurosci. Res. 70: 232–237.
. 2008. Microglial cells and Parkinson’s disease. Immunol. Res. 41: 155–164.
. 2008. TNF signaling inhibition in the CNS: implications for normal brain function and neurodegenerative disease. J. Neuroinflammation 5: 45.
. 2000. Naloxone protects rat dopaminergic neurons against inflammatory damage through inhibition of microglia activation and superoxide generation. J. Pharmacol. Exp. Ther. 293: 607–617.
. 2002. Microglial activation-mediated delayed and progressive degeneration of rat nigral dopaminergic neurons: relevance to Parkinson’s disease. J. Neurochem. 81: 1285–1297.
. 2006. Interleukin-10 protects lipopolysaccharide-induced neurotoxicity in primary midbrain cultures by inhibiting the function of NADPH oxidase. J. Pharmacol. Exp. Ther. 319: 44–52.
. 2000. Reduction by naloxone of lipopolysaccharide-induced neurotoxicity in mouse cortical neuron-glia co-cultures. Neuroscience 97: 749–756.
. 2000. A microtiter plate assay for superoxide dismutase using a water-soluble tetrazolium salt (WST-1). Clin. Chim. Acta 293: 157–166.
. 2000. Superoxide produced by activated neutrophils efficiently reduces the tetrazolium salt, WST-1 to produce a soluble formazan: a simple colorimetric assay for measuring respiratory burst activation and for screening anti-inflammatory agents. J. Immunol. Methods 238: 59–68.
. 2001. Role of intracellular thiol depletion, mitochondrial dysfunction and reactive oxygen species in Salvia miltiorrhiza-induced apoptosis in human hepatoma HepG2 cells. Life Sci. 69: 1833–1850.
. 2007. Systemic LPS causes chronic neuroinflammation and progressive neurodegeneration. Glia 55: 453–462.
. 2008. Endotoxin induces a delayed loss of TH-IR neurons in substantia nigra and motor behavioral deficits. Neurotoxicology 29: 864–870.
. 2008. Macrophage antigen complex-1 mediates reactive microgliosis and progressive dopaminergic neurodegeneration in the MPTP model of Parkinson’s disease. J. Immunol. 181: 7194–7204.
. 2009. Novel neuroprotective mechanisms of memantine: increase in neurotrophic factor release from astroglia and anti-inflammation by preventing microglial activation. Neuropsychopharmacology 34: 2344–2357.
. 2004. Anti-inflammatory activities of β2-agonists. Curr. Drug Targets Inflamm. Allergy 3: 271–277. 2002. Effects of β2-agonists on resident and infiltrating inflammatory cells. J. Allergy Clin. Immunol. 110(Suppl. 6)S282–S290.
. 2007. Microglia-mediated neurotoxicity is inhibited by morphine through an opioid receptor-independent reduction of NADPH oxidase activity. J. Immunol. 179: 1198–1209.
. 2003. Critical role of microglial NADPH oxidase-derived free radicals in the in vitro MPTP model of Parkinson’s disease. FASEB J. 17: 1954–1956.
. 2008. Effects of formoterol and salmeterol on the production of Th1- and Th2-related chemokines by monocytes and bronchial epithelial cells. Eur. Respir. J. 31: 1313–1321.
. 2002. Seven-transmembrane-spanning receptors and heart function. Nature 415: 206–212.
. 2004. Localized effects of cAMP mediated by distinct routes of protein kinase A. Physiol. Rev. 84: 137–167.
. 2008. Toll-like receptors differentially regulate GPCR kinases and arrestins in primary macrophages. Mol. Immunol. 45: 2312–2322.
. 2009. Fenoterol, a β2-adrenoceptor agonist, inhibits LPS-induced membrane-bound CD14, TLR4/CD14 complex, and inflammatory cytokines production through β-arrestin-2 in THP-1 cell line. Acta Pharmacol. Sin. 30: 1522–1528.
. 2007. Microglia-mediated neurotoxicity: uncovering the molecular mechanisms. Nat. Rev. Neurosci. 8: 57–69.
. 2010. Reactive microgliosis: extracellular micro-calpain and microglia-mediated dopaminergic neurotoxicity. Brain 133(Pt. 3): 808–821.
. 2007. Selective inhibition of NF-κB activation prevents dopaminergic neuronal loss in a mouse model of Parkinson’s disease. Proc. Natl. Acad. Sci. USA 104: 18754–18759.
. 2007. Neuroprotective activities of CD4+CD25+ regulatory T cells in an animal model of Parkinson’s disease. J. Leukoc. Biol. 82: 1083–1094.
. 2010. Regulatory T cells attenuate Th17 cell-mediated nigrostriatal dopaminergic neurodegeneration in a model of Parkinson’s disease. J. Immunol. 184: 2261–2271.
. 2008. Potent anti-inflammatory and neuroprotective effects of TGF-β1 are mediated through the inhibition of ERK and p47phox-Ser345 phosphorylation and translocation in microglia. J. Immunol. 181: 660–668.
. 2005. Theophylline stimulates cAMP-mediated signaling associated with growth regulation in human cells from pulmonary adenocarcinoma and small airway epithelia. Int. J. Oncol. 27: 155–160.
. 2006. New roles for β-arrestins in cell signaling: not just for seven-transmembrane receptors. Mol. Cell 24: 643–652.
. 2003. β-Arrestin-2 regulates the development of allergic asthma. J. Clin. Invest. 112: 566–574.
. 2007. β2 Adrenergic receptor activation stimulates pro-inflammatory cytokine production in macrophages via PKA- and NF-κB-independent mechanisms. Cell. Signal. 19: 251–260.
. 2009. β2 Adrenergic receptor activation induces microglial NADPH oxidase activation and dopaminergic neurotoxicity through an ERK-dependent/protein kinase A-independent pathway. Glia 57: 1600–1609.
. 2006. Therapeutic effects of clenbuterol in a murine model of amyotrophic lateral sclerosis. Neurosci. Lett. 397: 155–158.
. 2004. Combination therapy in ischemic stroke: synergistic neuroprotective effects of memantine and clenbuterol. Stroke 35: 1197–1202.
. 2006. β2-Adrenoreceptor agonist-enhanced recovery of locomotor function after spinal cord injury is glutathione dependent. J. Neurotrauma 23: 170–180.
. 2002. Stimulation of β-adrenoceptors activates astrocytes and provides neuroprotection. Eur. J. Pharmacol. 446: 25–36.
. 1999. Neuroprotection mediated via neurotrophic factors and induction of neurotrophic factors. Brain Res. Brain Res. Rev. 30: 176–188.